I have committed to a joint project with the Fiberarts Guild of Pittsburgh to produce a set of playing cards from fiber art to benefit FiberArt International 2010. All cards will be photographs of artworks done in various aspects of fiber. I believe that I am the only one to choose beadwork as my fiber art medium. I have the 6 of clubs and am basing my design on 3 sets of nightclub dancers from 3 different dance craze eras--The Charleston of the 20s and speakeasies, Swing, and Disco. 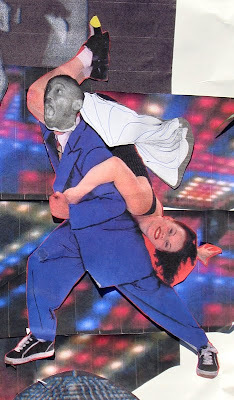 My planned design is collaged to fit within the allotted 19"x12" proscribed space. 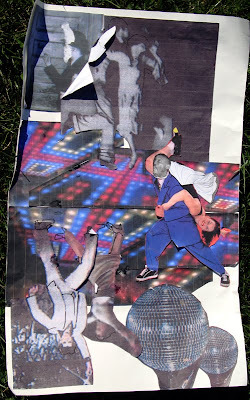 I have elected to reverse the orientation of the Disco dancers as they would be in a real playing card and to choose a swing set where the female dancer is in a reversed throw position. My preferred beadwork technique is brick stitch. The advantage of brick stitch over loomwork or peyote stitch in expressing a design is that brick stitch begins with a "bead ladder" which can be bent in any direction and fixed in place by increasing on the outside of curves and/or decreasing on the inside of curves in the adjacent rows. Therefore, the lines of beads can be made to extend in any direction following the lines of the design. Curves can also be smoothly reproduced. 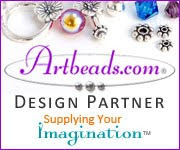 A variety of bead sizes and shapes incorporate nicely as well. I can also start anywhere and link the various parts later. When planning a 2-D brick stitched figure (I call them “paper dolls”), I start with a photograph, drawing or collage as here in exactly the same size that I want the finished figure or picture to be. I plan which direction the beads will run in the various parts of the photo and DRAW THE LINES ON THE PICTURE. I have decided to start with the swing dancer's skirt.